Want to post the whole article, but after our discussion on copyright I dont know if I should chance it. This is from a 1958 GUNs magazine article I found in the 100s of old magazines I got from my dad. Mikhail Margolin, a gun smith who didnt even start to think about guns until after he was accidentally shot and made blind, has build some of the best guns Russia has ever produced. In fact, it was his gun that help the Russians do so well in the Melbourne Olympics, according to the article. It was an Upside Down Gun. Barrel on the bottom. His guns are some cool designs too. I'm thinking about posting the article in sections. Not sure yet. Depends if anyone is interested. But the most amazing part is, with no background in guns, he designs and builds completely blind! I also have some Remington cowboy prints from my dad I scanned if anyone is interested in copies. Definitely interested in reading the entire article DD. It surprizes me that nobody mention here the Margolin pistols, don't you know them? I've seen them both in Czech Republic and in Belgium. They are nice .22 LR target pistols and are realy inexpensive alltough they come in a wooden box with a lot of extras. I used it once for a friendly competition in CR and I remember that I still don't know how to adjust the thing. Both bead and notch are adjustable but since the changes are so little and the writing is in russian, I still don't know how to turn to bring the bead up or down. But if you ever should get a chance to buy such a thing, don't be afraid because they are so cheap, just don't hesitate and take it home. 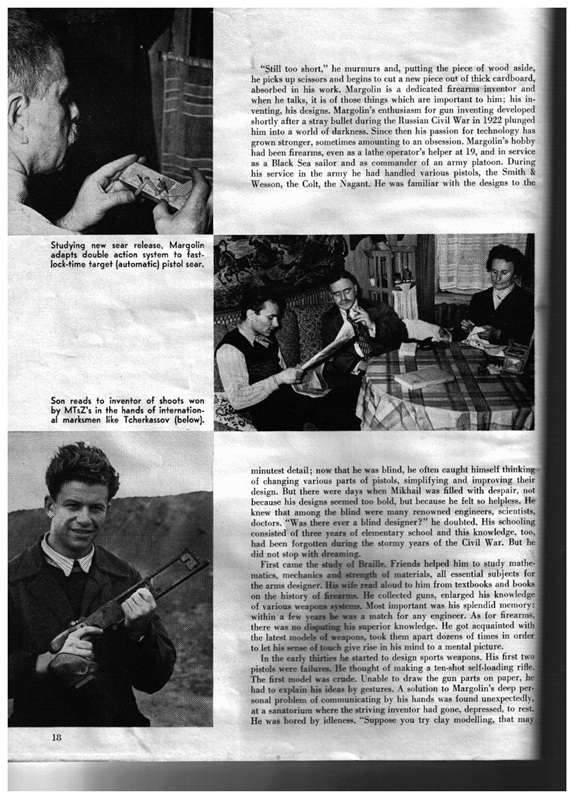 Here is a link to guns magazine online, the article that Dan told us about is the Sept 1958 is, scroll down and click on the sept 58 issue and download it. Also, you can download any others that you want, its free. As Gelan said OV1...a veritable treasure trove mate. I just found out about this Tuesday reading the printed edition of Nov/Dec guns magazine. The company that owns guns magazine and American hand-gunner is gradually putting out digital copies of their magazines free of charge. Here is a link for American hand-gunner. There are 2 more publications put out by the same company that also have digital editions available. One is American Cop and the other is Shooting Industry. Edit: You can either view or download the digital edition by clicking either view or download catalog as pdf file. Lyman sights for 8 bucks, Garand rifles for 48 bucks, Mausers for 14 bucks I'm sick lookin at the old magazines. Nice find Omni! !